The cello part for Mendelssohn's Scherzo from A Midsummer Night's Dream, Op. 61 has been edited by Ronald Leonard, principal cellist of the Los Angeles Philharmonic from 1975 until 1999. Leonard's bowings, fingerings and other editorial markings have been added throughout the score. Mendelssohn's A Midsummer Night's Dream took two forms during the composer's professional life. The first was a concert overture, Op. 21, which he wrote in 1826 near the beginning of his career. In 1842, Mendelssohn would incorporate this overture into the second, his larger incidental music, Op. 61, for a production of the original play by William Shakespeare. This larger version of A Midsummer Night's Dream includes the world-famous Wedding March and a number of both vocal and purely instrumental movements. The Scherzo is one such instrumental section, acting as an intermezzo between Acts I and II. It is characterized by its light scoring which features chattering winds and dancing strings. 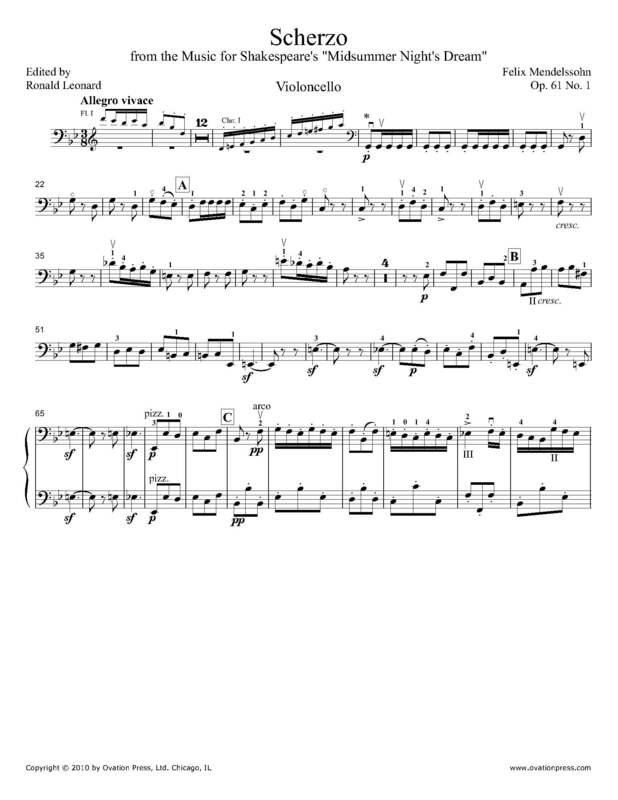 Download and print the score today to gain access to expertly edited Mendelssohn A Midsummer Night's Dream Scherzo cello fingerings and bowings from Ronald Leonard!